Sometimes there are people trying to make Remote Desktop connection from office or Internet to their home network's computer, but couldn't make it works. However the remote connection is working well if the user connects it at home. So what's the problem? The reason is most of the users install router at home and share single Internet connection, which means there is only one public IP that used by router to route traffic to/from Internet. When the user key in the public IP of his/her home network (usually we can check the public IP on the router) to make connection, the router will receive the network packets but don’t know what to do about it and drop the packets eventually. Solution?? You need to enable port forwarding or virtual server on the router to forward the packets to that internal Remote Desktop enabled computer for establishing the connection. You should be able to find these features on most of the routers. If your don't have router or router does not support this feature, check out these routers ! 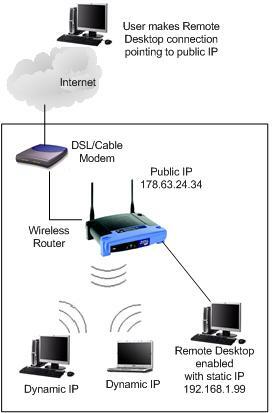 Above is a typical home network diagram, there is Ethernet/wireless router installed connecting to Internet and also other home computers. So here is how to make it works!! You must assign static IP address to that computer with Remote Desktop feature enabled. 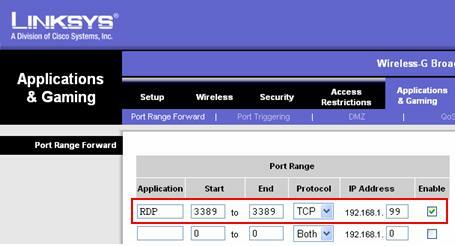 After that log on to your router management page, look for the port forwarding or virtual server setting. If you are not sure where to look for, read the router manual. Below is the port forwarding parameters I put on Linksys WRT54G wireless router, and after that I have no problem to make Remote Desktop connection to home network's public IP 178.63.23.34 remotely from my office. When the router receives the packets with destination port TCP-3389, it will forward those packets to computer with IP 192.168.1.99, which is my Remote Desktop enabled computer. Note: If you enabled remote desktop web connection, then you would also need to do port forwarding for port TCP-80 on router , so that the users can do remote desktop access from Internet by using web browser. Return to top of "Remote Desktop Connection from Internet"